Las Vegas’ new United Soccer League team looked at players for nine hours Saturday at Kellogg Zaher Soccer Complex. Duce Bell had a chance to make one of his dreams come true Saturday by impressing the Las Vegas Lights FC at the team’s first player combine. He just had to do it out of position. With the club putting together 8-on-8 scrimmages to try to get a quick look at about 500 attendees, the former semi-pro player with the Fresno Fuego had to play at left back instead of his normal spot at right wing to make his team work. Bell didn’t let the switch deter him, though, and he was one of about 75 players selected by the Lights to return for the combine’s second day on Sunday. 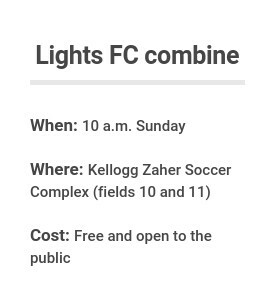 Bell was one of many local players the Lights tried to evaluate Saturday at Kellogg Zaher Soccer Complex so the team can make good on its promise to have someone with Las Vegas roots or ties on its roster. To do so, the club played four hourlong 8-on-8 scrimmages at a time from 10 a.m. to 3 p.m. After each set of scrimmages was over, the Lights announced which players the team wanted to look at again Sunday. With the field narrowed, the Lights will get a better look at their final group of players and decide whether any of them are worth signing to the team’s first roster. Coach Jose Luis Sanchez Sola, commonly known as Chelis, said he wants to have all his players in place by Jan. 3 or 8. Many former UNLV players attended, as well as members of the Las Vegas Mobsters of the United Premier Soccer League, including former Rebels Julian Portugal, Salvador Bernal and Sebastian Hernandez. All three heard their names called after their scrimmages and got the chance to play soccer another day. “The first step’s done,” said Portugal, a 25-year-old midfielder. The chance to be a professional soccer player drew many other locals to the event, including forward/midfielder Vernon Jeffers, who scored in his scrimmage and was asked to return Sunday. Most didn’t reach the second step in the process, like Las Vegas resident Jeronimo Urbina, who tried out despite not playing for a team currently. Urbina remained undeterred after not making the cut and vowed to return when the team has another local combine next year.